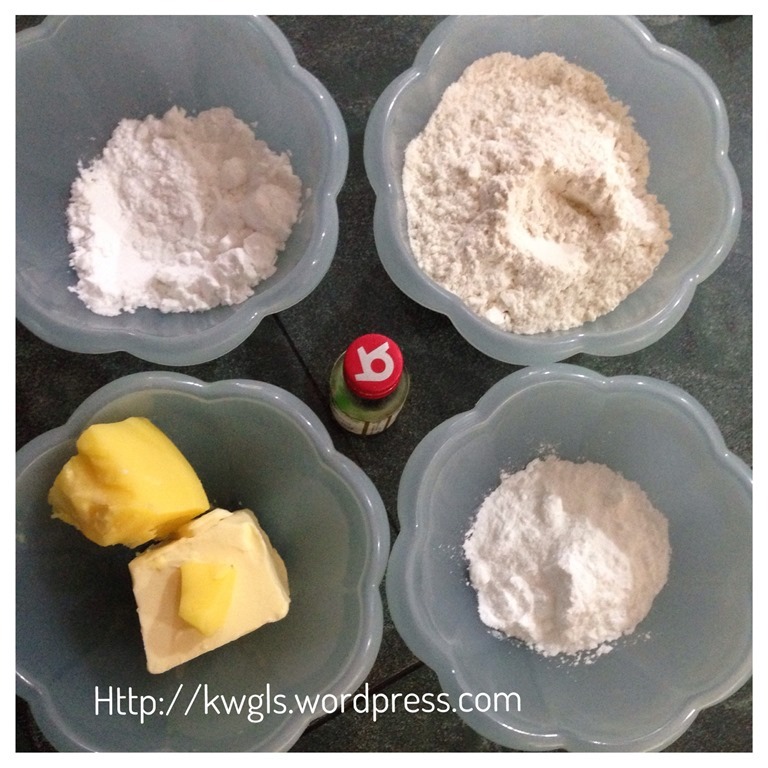 Uploaded a new recipe -recipe 2 with only 4 ingredients of which potatoes starch can be substituted with plain flour. Easy to pipe too. I have not promote this post because the picture is rather blur. Therefore, today, I have decided to prepare some for picture taking purposes. 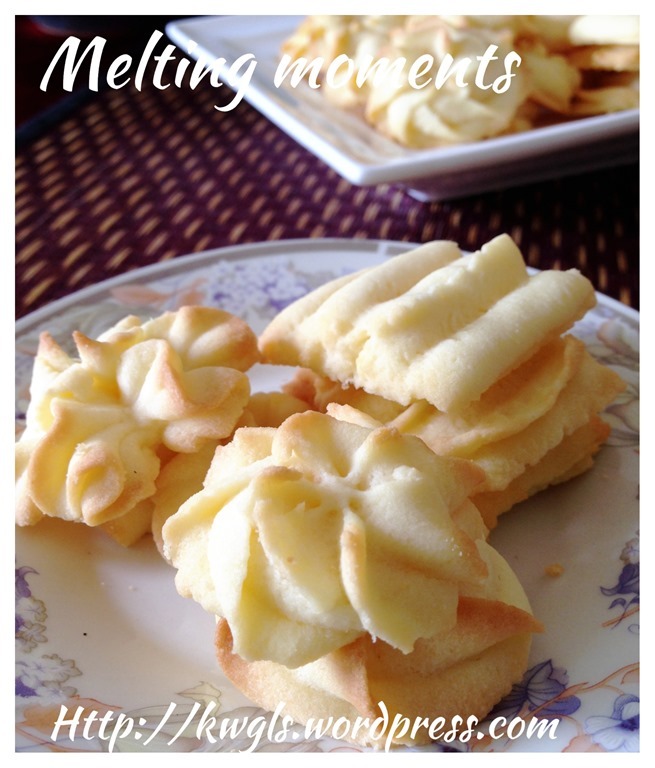 This will be a relatively short post on MELTING MOMENTS. 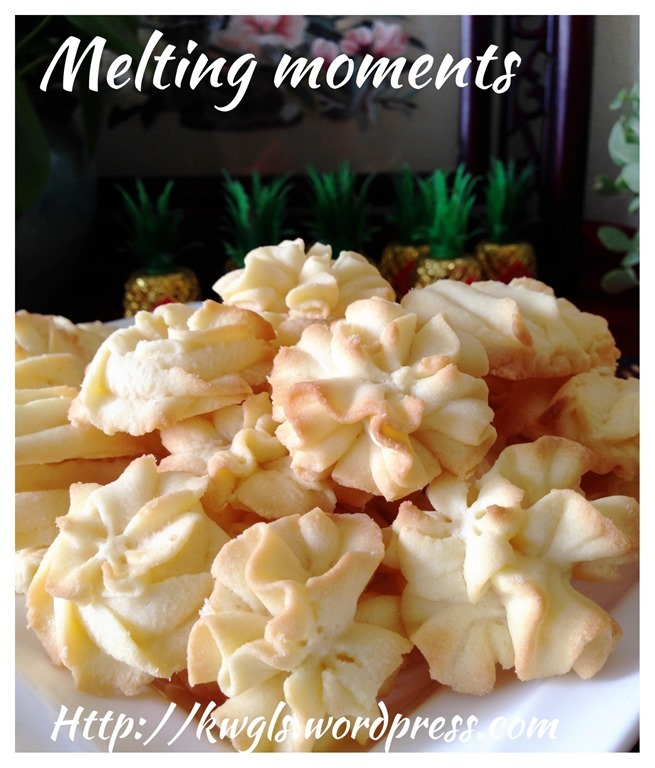 This is not a new cookie but a cookie that bring fond memories. 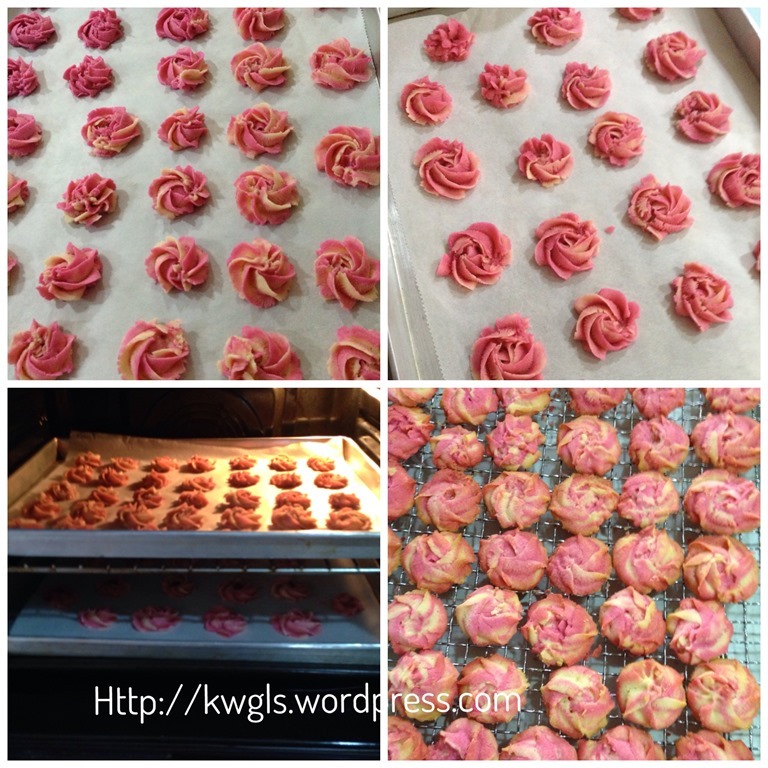 In the 1970’s and 1980’s, there are not many cookies choices and this is one of the simple cookie that was served during festivals such as Chinese New Year and Hari Raya. It was not surprising that these cookies were served because the ingredients, preparation and baking methods were rather simple. 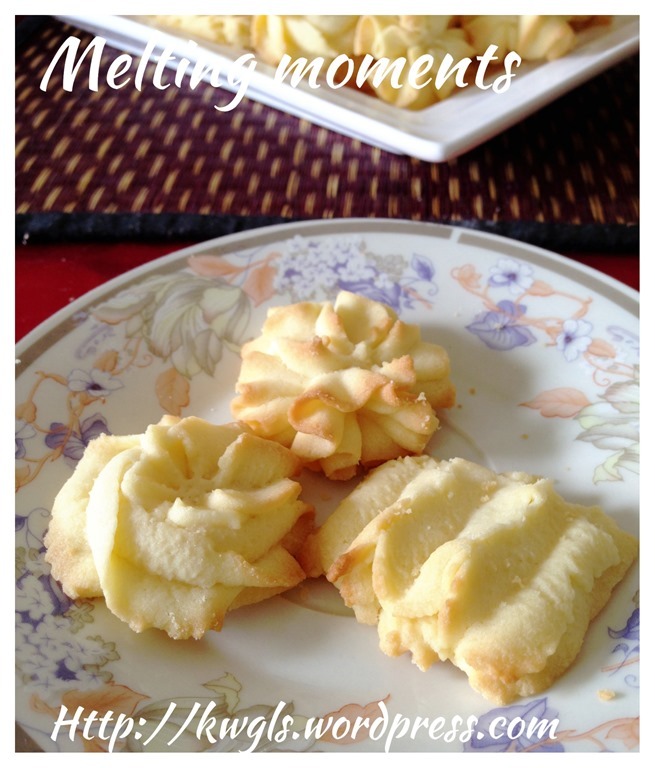 Then, Malaysia economies just picking up and gradually introduced to Western cookies. Most people will not have an conventional oven and these cookies can be prepared even using an ovenette, mini oven or toaster. Hand creaming was used as opposed to the current machine whisking. The ingredients then were only flour, sugar and butter. 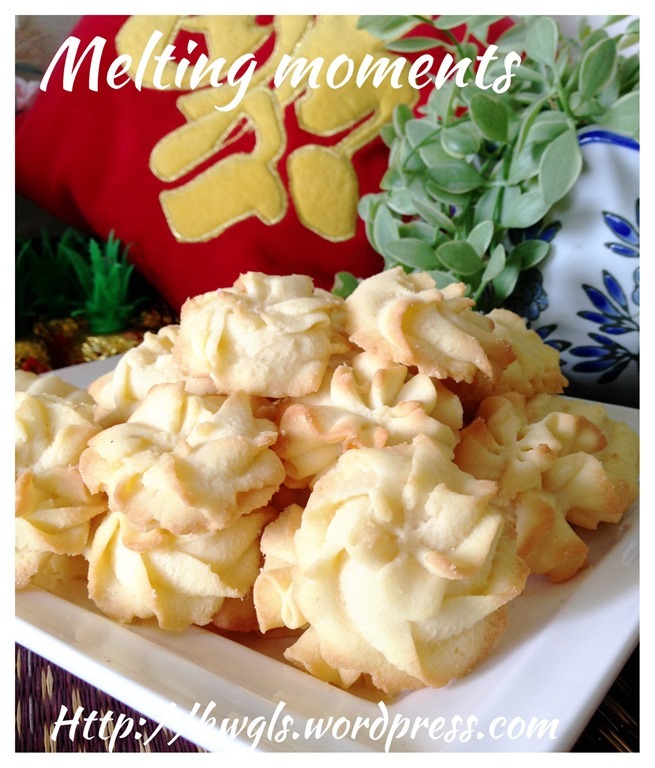 As times went by, the ingredients have started to include corn flour to better the texture of the cookie and shape have also change with more and more piping nozzles. Frankly speaking, I am unsure what is the name of this cookie. 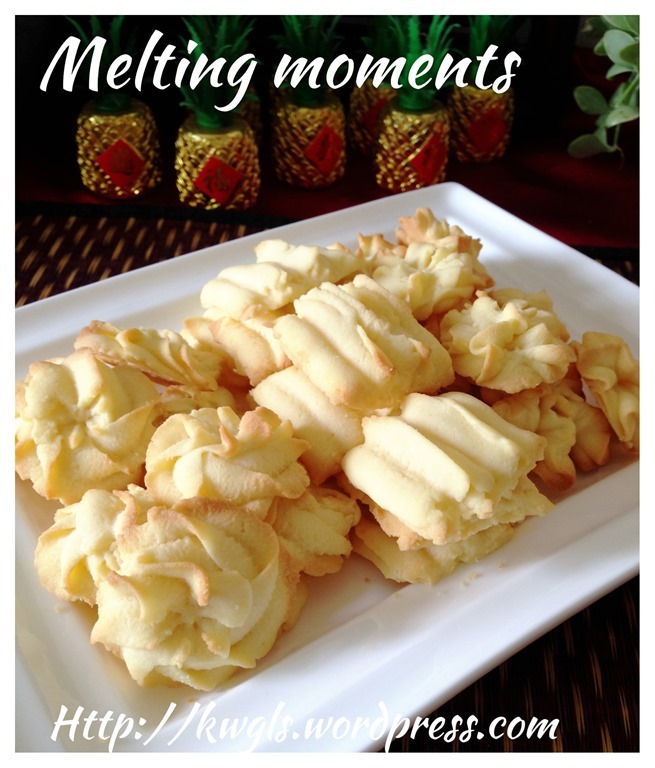 I knew people are calling it melting moments, but if you Google the internet, the cookie “melting moments” come in all shapes and decorations. The only common characteristic after analysing the ingredients of various recipes is that there are flour, sugar and butter as the 3 main ingredients. As for flour, some have used a mixture of corn flour and some even use custard powder. 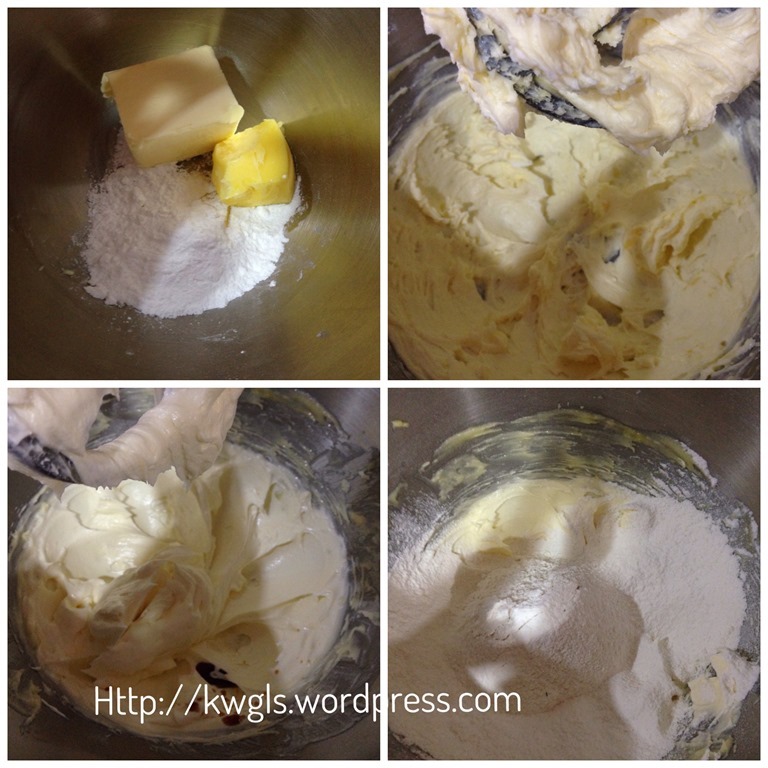 This recipe is a modified recipe, I have substituted part of the butter with ghee. I have briefly explained ghee, a type of clarified butter in my Indian Short Bread, Nan Khatai post. Any cookies made with ghee will definitely be more aromatic than those made with butter or margarine due to its slightly higher fat content. The trade off is that the cookies can become shapeless as the ghee melts (have modified the recipe to let it stay in shape). Though the picture in this post may not be that appealing, I can assure you that the taste is superb. To create some visual effect and give a fresh feel from its traditional look, I have used Wilton 2D nozzle to pipe the dual colour batters and but this is optional. Cream the butter and sugar until light and fluffy. Add in the eggs and vanilla essence , beat until well incorporated. Sift in the potatoes starch and plain flour, either use the machine at low speed or use a spatula to stir until well mixed. Take out half of the batter set aside. 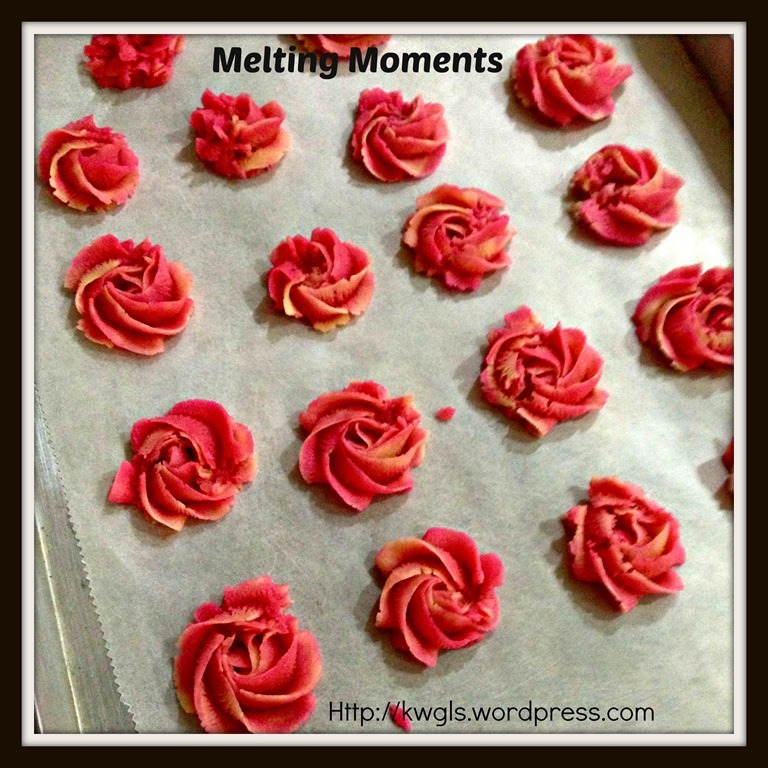 For the other half, add a few drops of the red/pink colouring. Stir until well mixed. 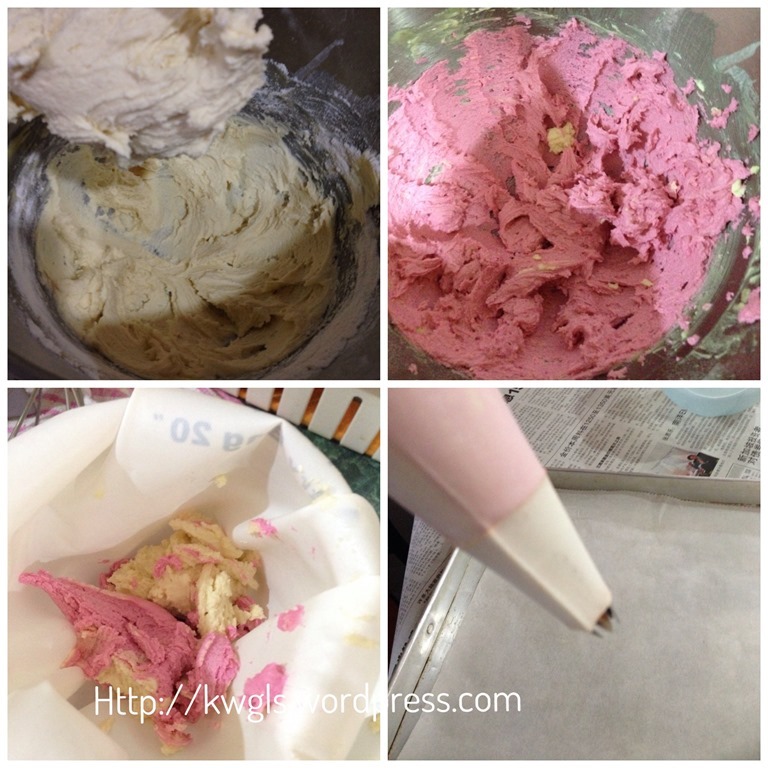 In a piping bag fitted with nozzle 1M or 2D (Wilton categorization), transfer the pink and beige batter into the piping bag. Pipe the batter into the baking sheets in the pattern of a big swirl. Bake in the oven for about 10 minutes. Let it rest in the baking tray for 5 minutes before transfer to the rack for cooling. Store in an air tight container. Substitute part of the butter with ghee will help to enhance the buttery aroma of the cookies. Do give it a try and let me know if it meet your expectations. 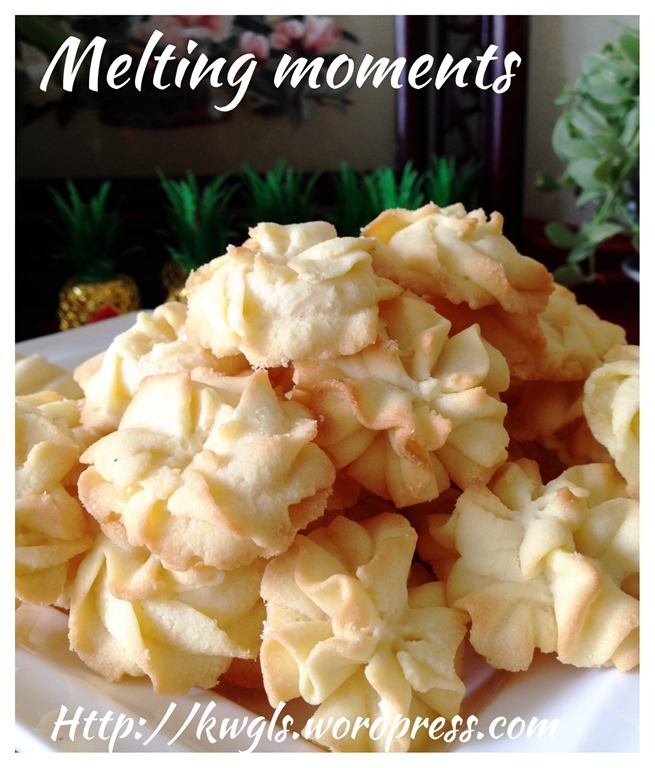 This entry was posted in Cakes and cookies, Chinese New Year 2014, Christmas 2013, Food Preparation Series and tagged 8, butter cookies, danish cookies, GUAI SHU SHU, Guaishushu, kenneth goh, melting moment, Melting moments cookies, postaday, traditional cookies. Bookmark the permalink. Great job! they look fabulous! 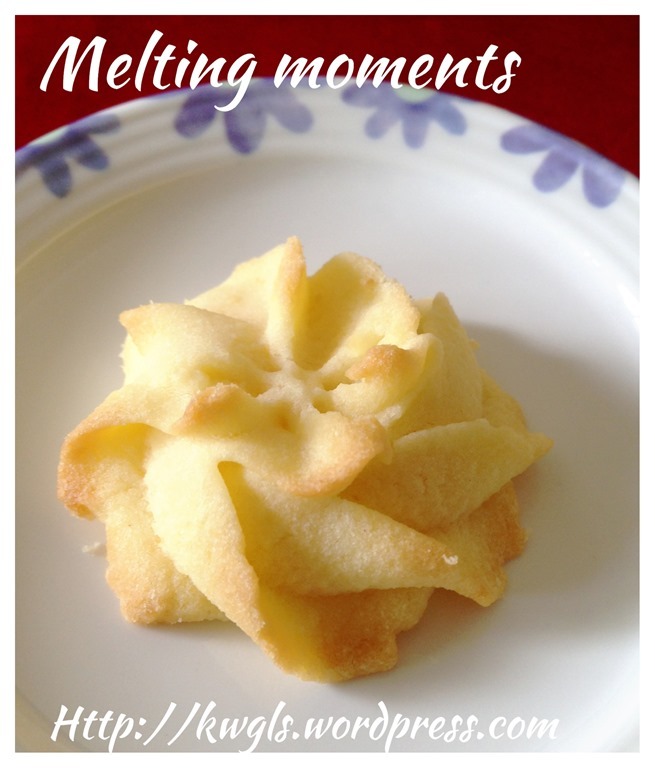 Thanks for linking up with #recipeoftheweek. I’ve pinned this post. What is the 40g of eggs for? Dear Kenneth, do we add the 40g egg after creaming the butter and sugar? Also… might I prepare the dough and keep in freezer in advanced? I would like to prepare it now and bake it just before Chinese New Year if possible… Thanks for your detailed explanation and recipes! Yes, after creaming the butter and sugar. 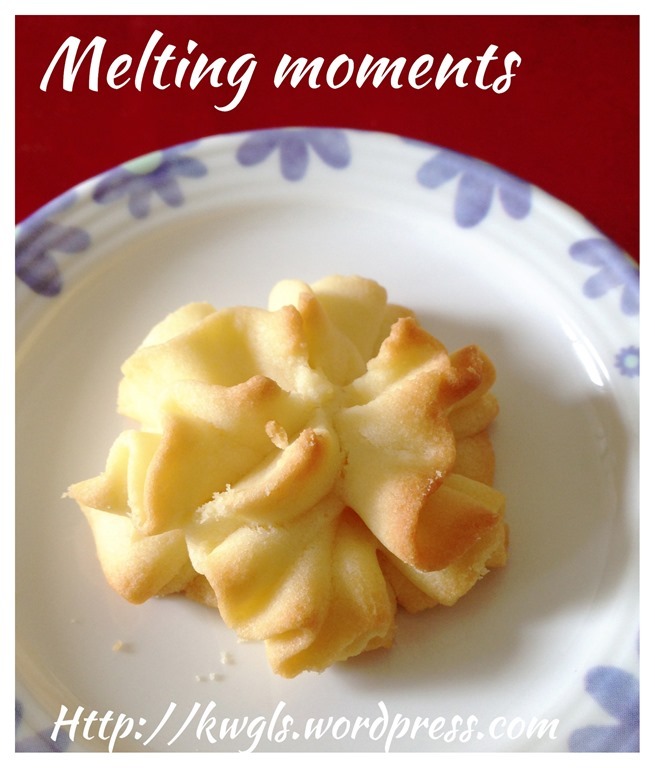 I seriously believed you can prepare and keep in freezer in advance like other short bread cookies. Kenneth sifu, dont have potato starch ,can i substitue with corn flour.